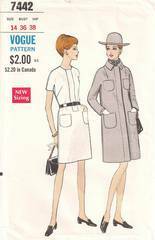 Original vintage sewing pattern from the 1970's for misses' one-piece dress and coat. Straight dress with inset front band has high square neckline. Short kimono sleeves with gussets. Patch pockets and purchased belt. Straight coat with front snap closing has rolled collar and patch pockets. Wrist length kmono sleeves with gussets. Purchased scarf. Size 14, Bust 36, Waist 27, Hip 38. Pattern is uncut, complete and in original factory folds. Envelope and contents are all in excellent condition.